With solar light and energy on the rise, it is time to update your plug-in outdoor lighting to simple and self-sustaining solar lights. Not only is solar lighting a sustainable and green choice, it is typically easier and often more aesthetically appealing than corded or battery-operated lights. You don’t have to think about remembering to run the extension cord out in the summer, and you don’t have to deal with dead or eroded batteries. Simply place these lights where they will see some rays, and they are good to go. Of course, solar lights are not just about functionality. Sure, they light your way and free up the need for running power from the house, but guess what? They can look totally stylish, too. With solar energy becoming more and more common, there are new and interesting solar designs coming out all the time. These beautiful and creative solar light ideas that you can use in your garden or patio space are interesting and unique. Even better, they can easily be adapted to fit your theme and space. Take your time, put them in a splash of sunshine, and enjoy your warm summer nights powered by your sunny summer days. This simple and fun craft can be created from materials at your local dollar or thrift store and can be made in a variety of colors, shapes, and sizes for a fun mushroom patch. 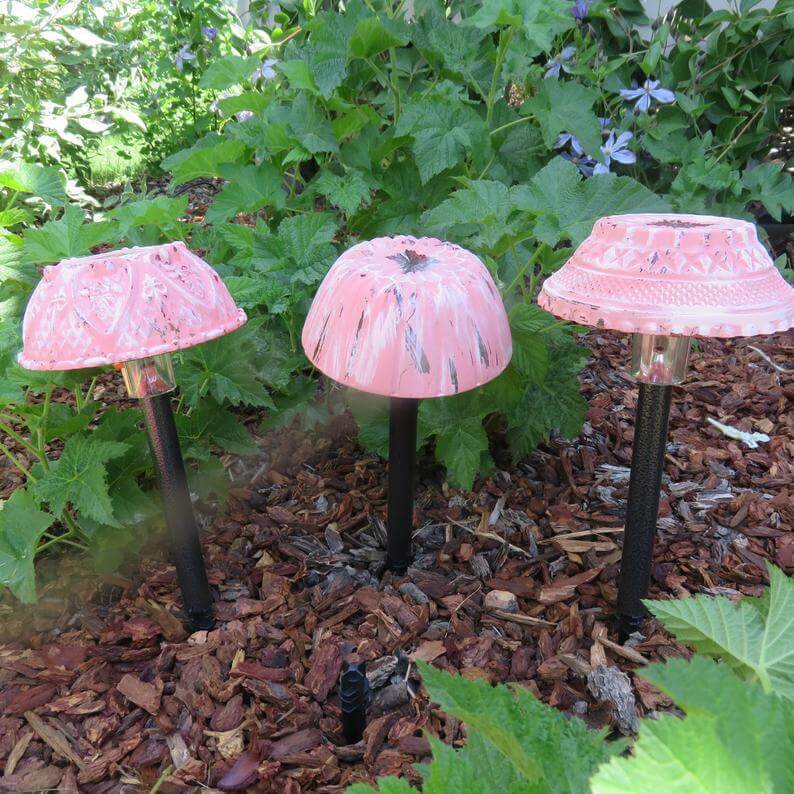 This design is also a perfect place to add a small solar lamp to make these beautiful mushrooms glow. Add an element of sustainable elegance to your outdoor dining space with these simply crafted solar candles. Just find some beautiful candlesticks and colors or decorate them as you choose. Then add in some standard staked solar lights for a complete look. Just be sure that the lights you purchase will fit into your holders. The best DIY projects are ones that take something old and upcycle it into something new. 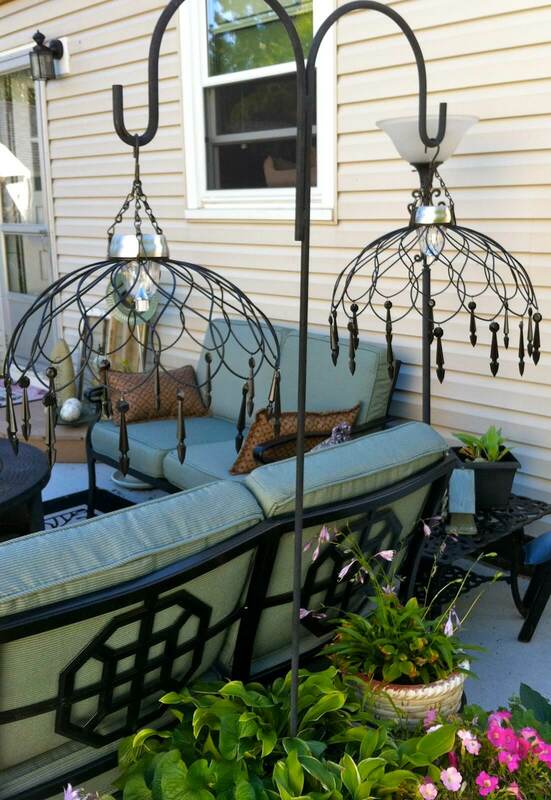 These lights use old lanterns or light fixtures to create beautiful solar-powered lights for your garden space. You can use any lantern, but if you are able to find one that leaves the solar pad exposed, you won’t have to worry about charging your lights. This look brings together a lush potted plant with an adorable classic lamp for a perfect addition to a porch or garden. 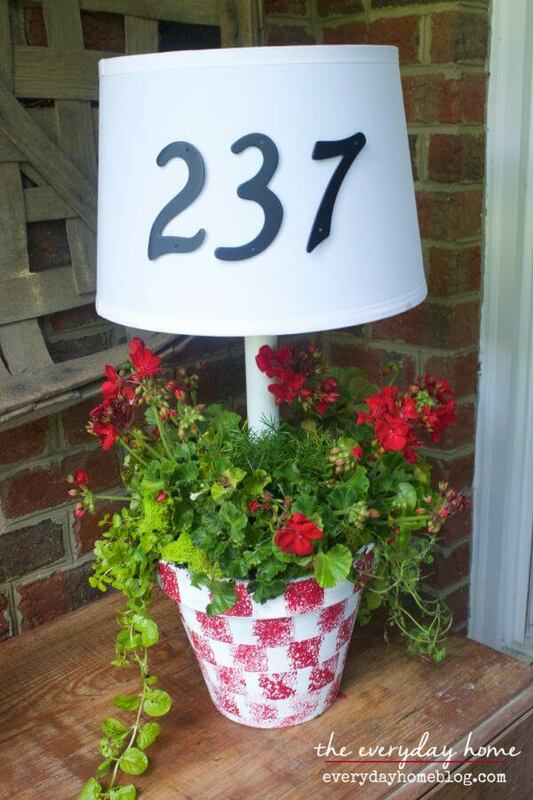 With the DIY nature of this piece, you can easily customize the size, shape, colors, and plant to your liking and, as pictured, can add house numbers or a summery word to your lampshade. Oftentimes, after a hanging plant has run its course you are left with a pretty wire basket without a purpose. If you’ve been there, this chandelier is exactly for you. It is super simple, but the effect it makes is incredible. 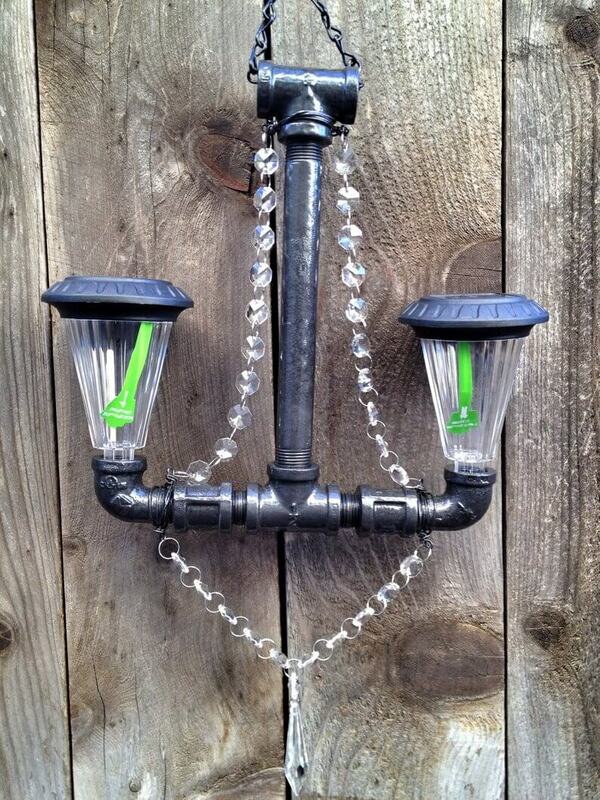 Already designed to be hung, this look only needs a center solar light and any additional décor that you choose. If you are looking for a quick and cute cover for your next solar light ideas, it does not get simpler than this. 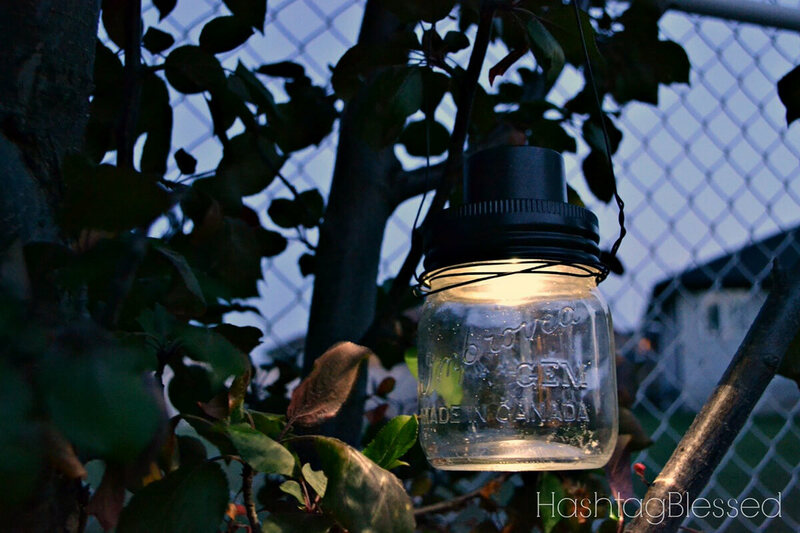 Pick up your favorite mason jar – colored or clear – and simply put them on top of your staked in lights. That’s it. Be sure to pick a jar that allows them to charge. 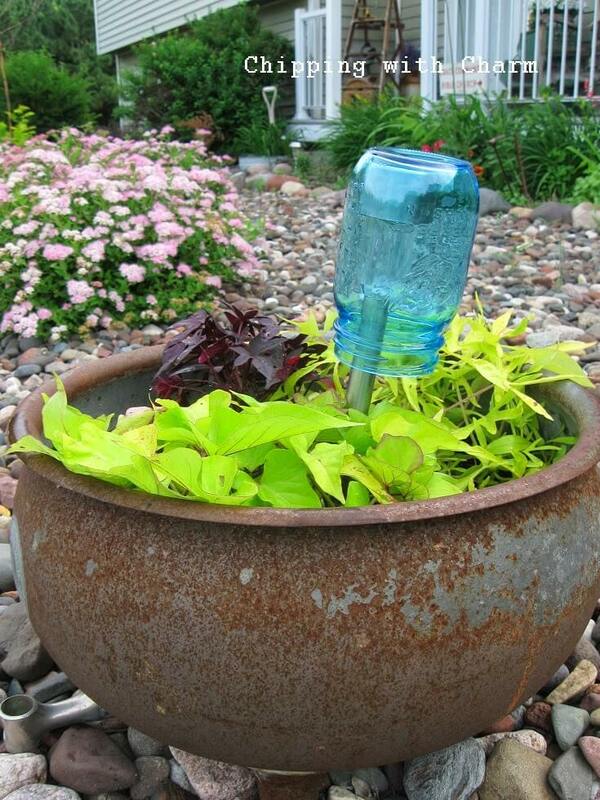 A very cool way to light up your outdoor space is to use solar light lids. These fit on standard mason jars, meaning you can create whatever sort of look you wish with your jars and turn them into beautiful lamps. 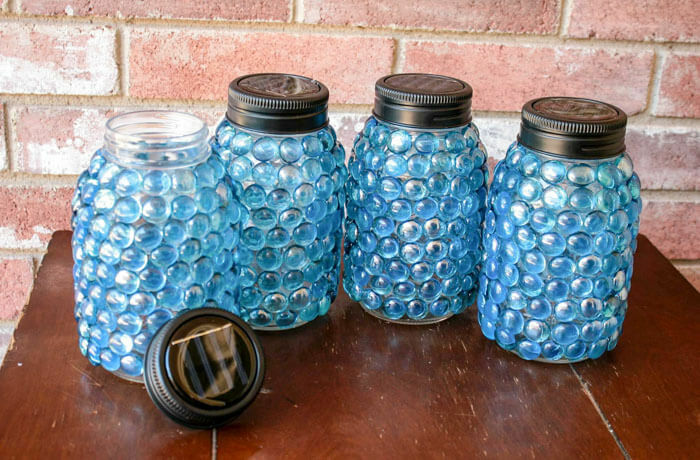 This gorgeous idea takes shiny blue glass beads and adheres them to the jar for a lovely look. If you don’t want to just stick your solar lights in the ground, a great alternative is to create one of these beautiful two-tiered planters. Not only does this elevate your light and solar panel source to ensure it isn’t covered or overshadowed, but it also looks good doing it. 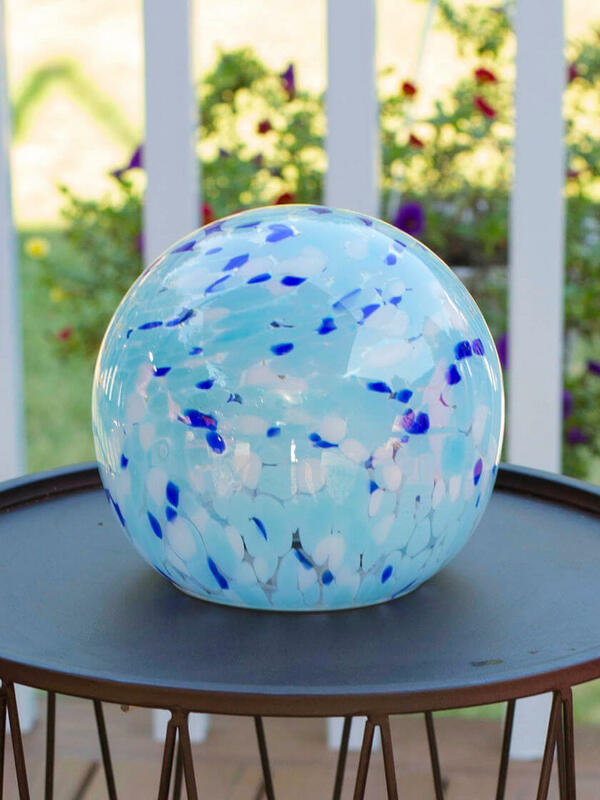 With the effect of a crystal ball, this lovely blown orb conceals a hidden solar panel to light up your outdoor space. With these playful colors, your lights will give off a pretty glow wherever you place them throughout your garden. Another magical element is that these lights turn themselves on as the sun goes down. 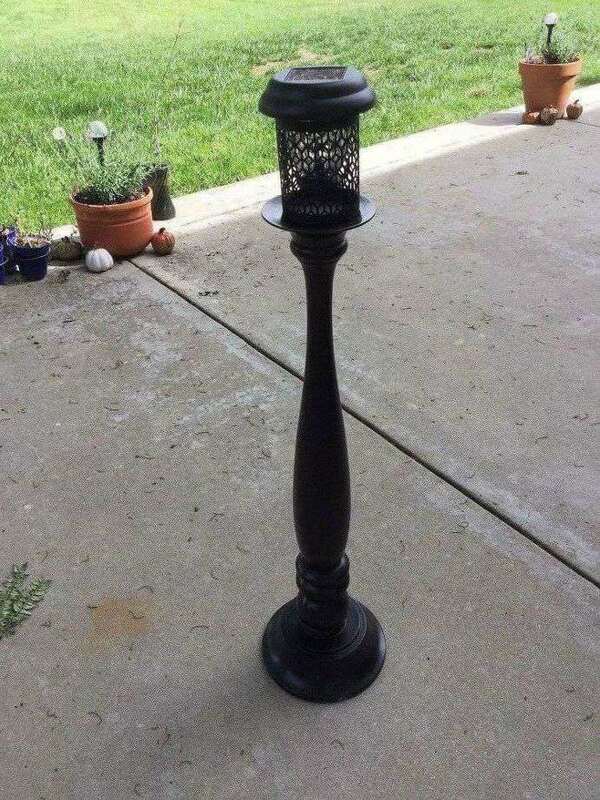 Make use of an old candlestick by turning it into a solar light holder. With just a few tricks, you can take apart a standard solar stake light and turn it into this romantic solar candle. Perfect for an outdoor dinner set, this look only requires a pretty cup that you can use to cage the light. 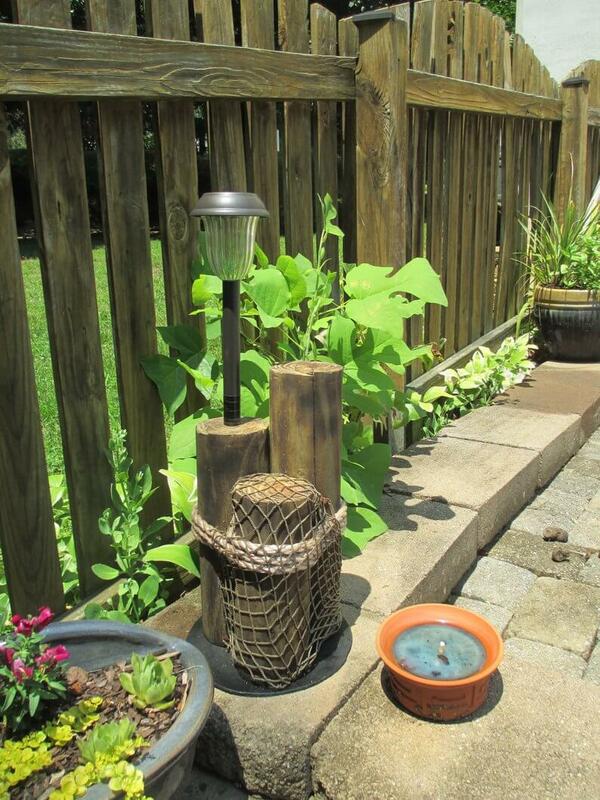 Making use of wood on your property is always a great place to start a solar light ideas DIY project. 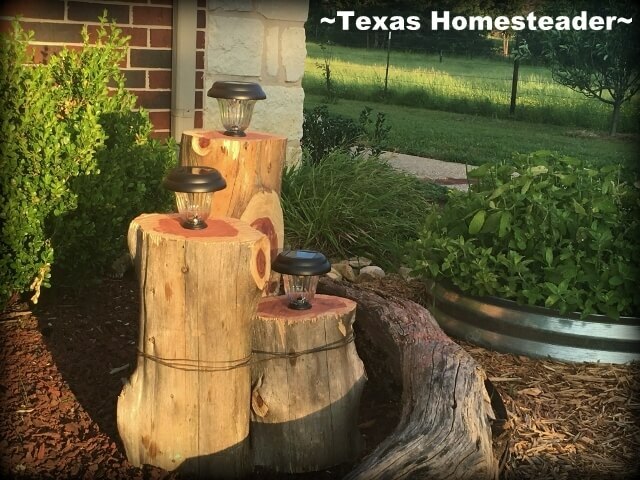 This one takes a few logs and combines them to create a multi-level display for your solar lights. Just know that for this project you will need a few special tools to drill and cut down the wood to size. A great place to add lighting is from tree branches. It creates a magical feeling that the tree is alive or that you have friendly floating lightning bugs playing in the garden. 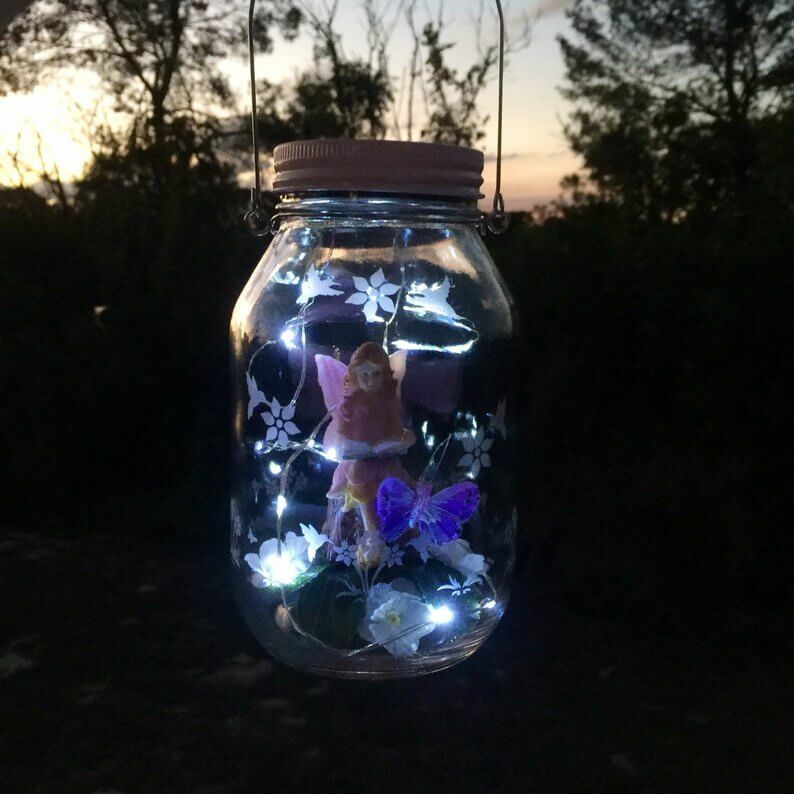 When you use this fun project for your outdoor lighting, you have total control over jar colors, tree placement, and how many lights you use. 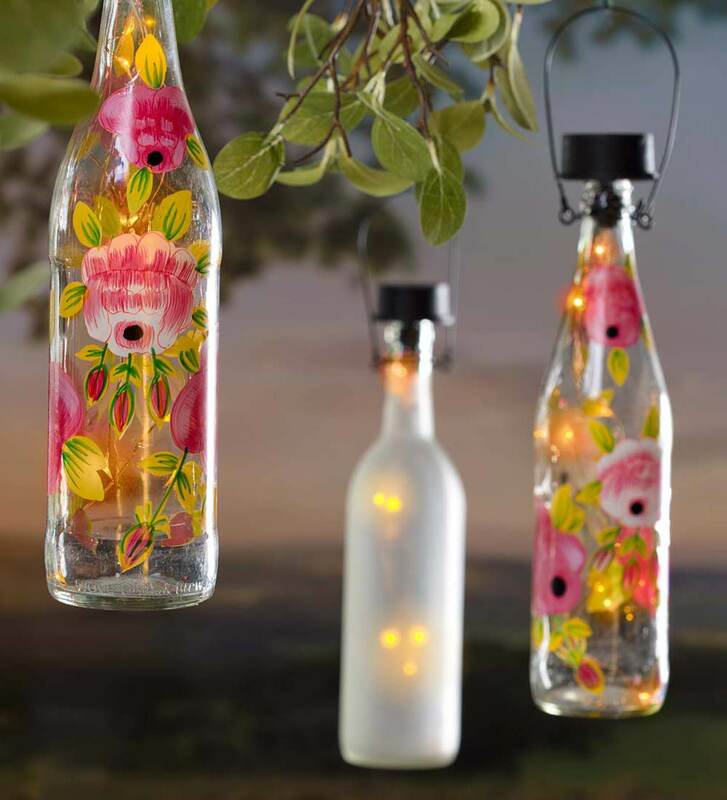 Bottles gives you a large canvas for design, and they are great when you want to include multiple lights. 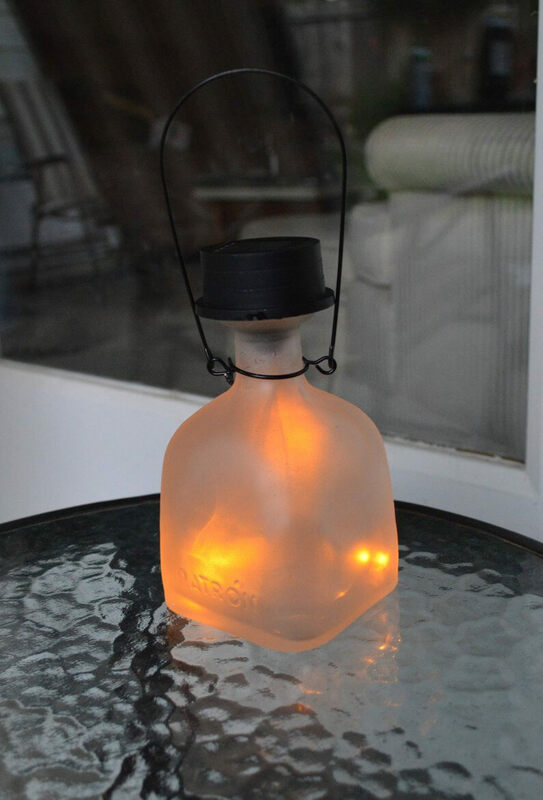 When creating your hanging bottle lantern, you can decorate them as you choose or leave them clear. Whatever you decide, it will have a lovely effect when lit from the inside with playful solar fairy lights. 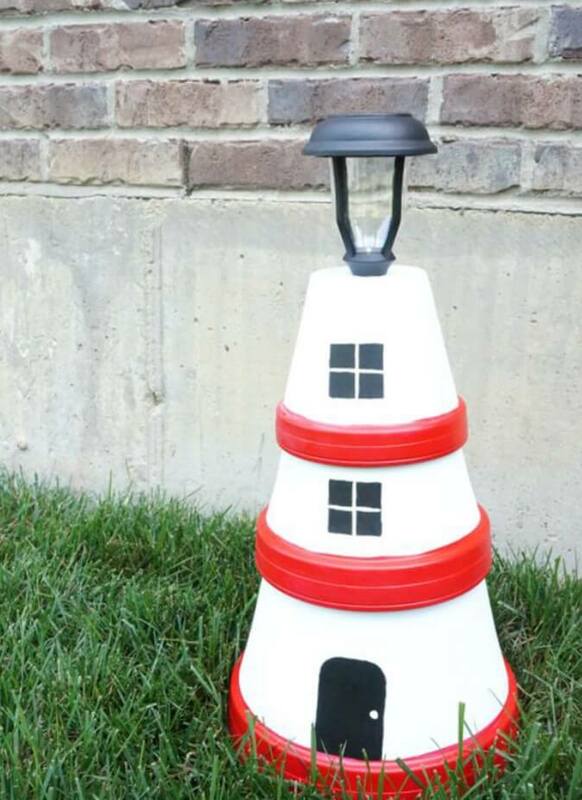 A clever and creative use of clay pots, this lighthouse is beachy, adorable, and practical, featuring a solar light atop the super cute hand-painted lighthouse. 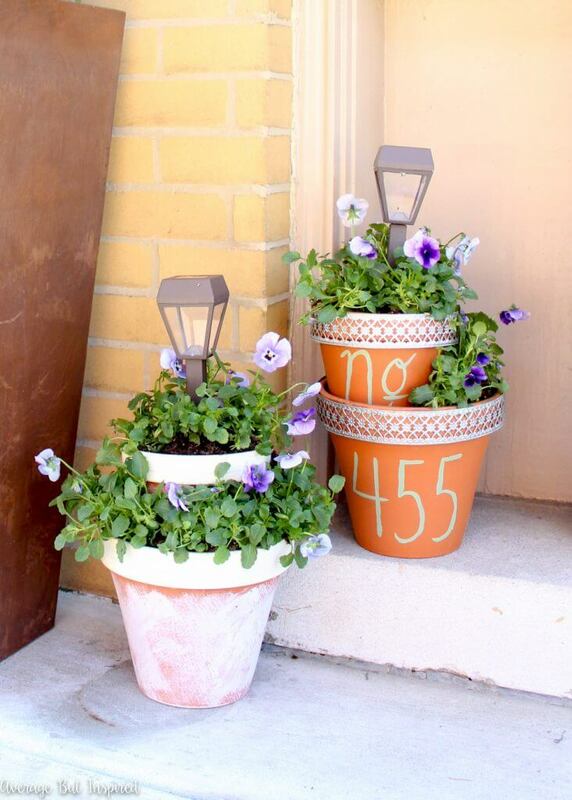 With its simple yet effective design, you can create a few of these as a family project, alternating between different colors and numbers of pots for a varied look. 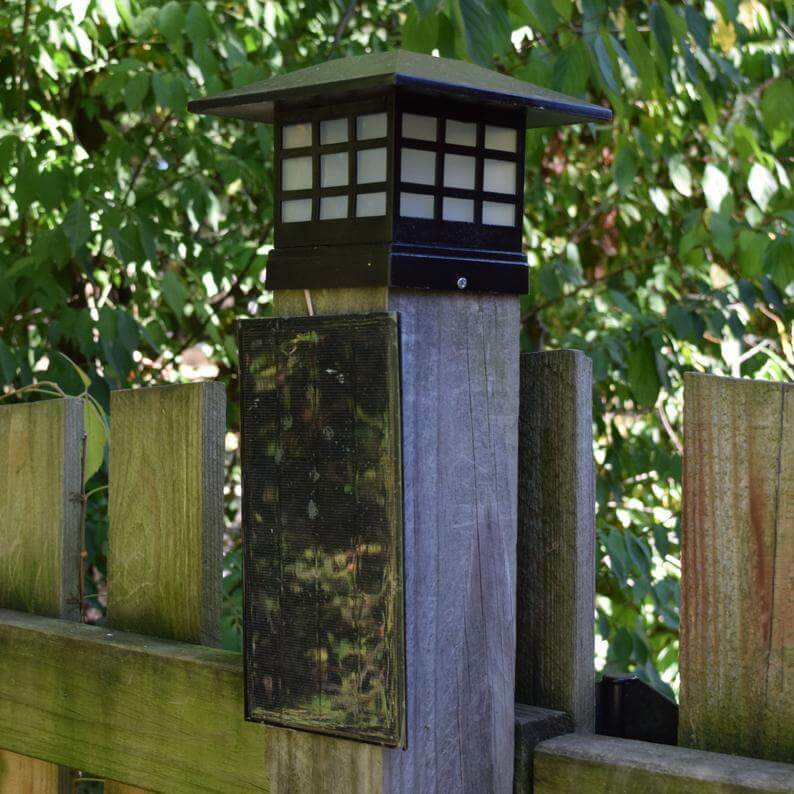 Designed specifically to be placed atop fences posts, this well-crafted solar light has a simple look that can blend well with virtually any décor. A noteworthy feature of this light in particular is that it charges in the shade, produces plenty of light to last through the night even when it’s cloudy during the day. 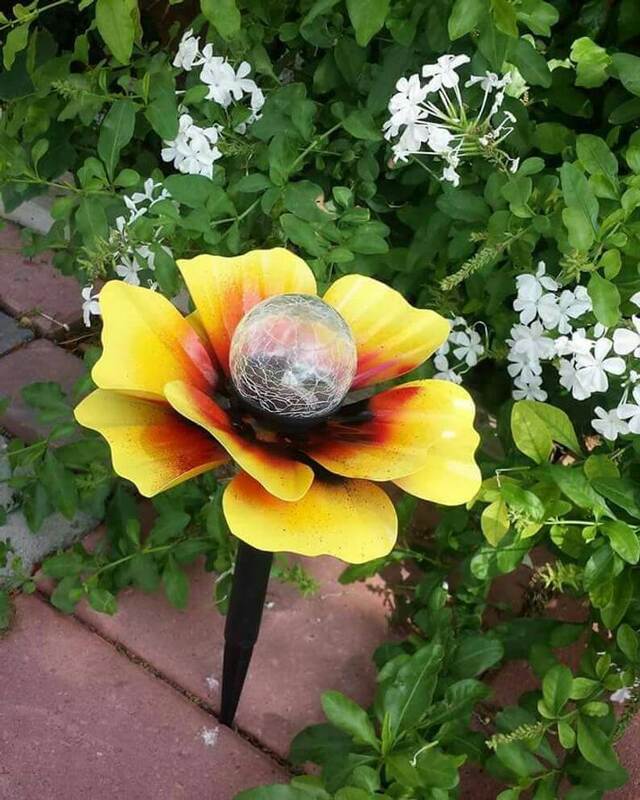 There is no better way to disguise a garden light than making it look like a flower. Add this pretty solar lamp to your outdoor décor for a bright flower that doesn’t fade throughout the year. 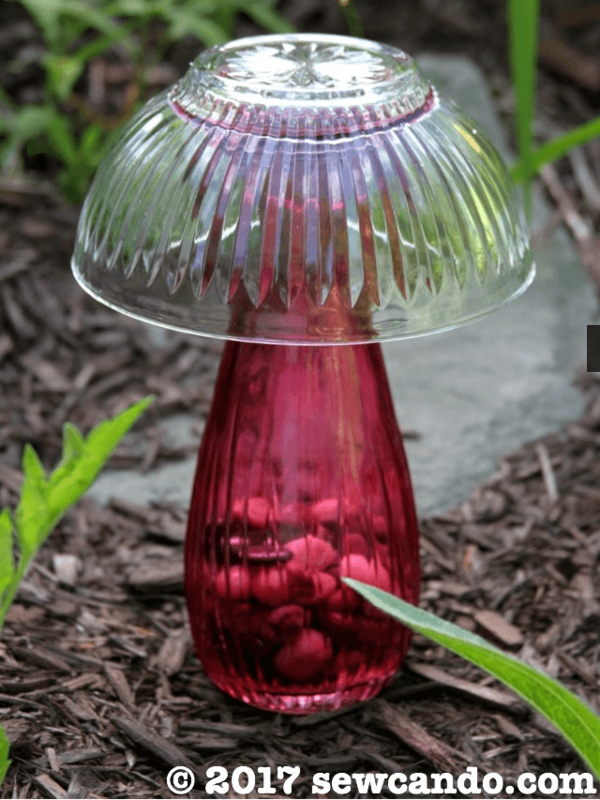 The cute bulb light will add a practical and pretty touch to your outdoor space. 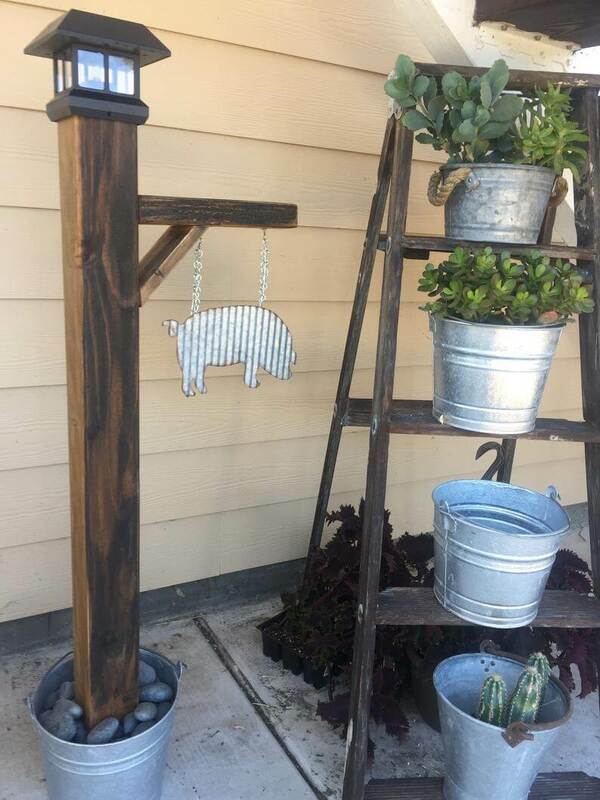 This little lantern-style solar light post adds a burst of light to those darker outdoor spaces and enhances décor with an adorable hanging metal pig. This piece has a vintage farmhouse feel and goes well in any outdoor space. The cute galvanized pig has so much charm and draws the focus from the practical light to the sweet hanging porker. 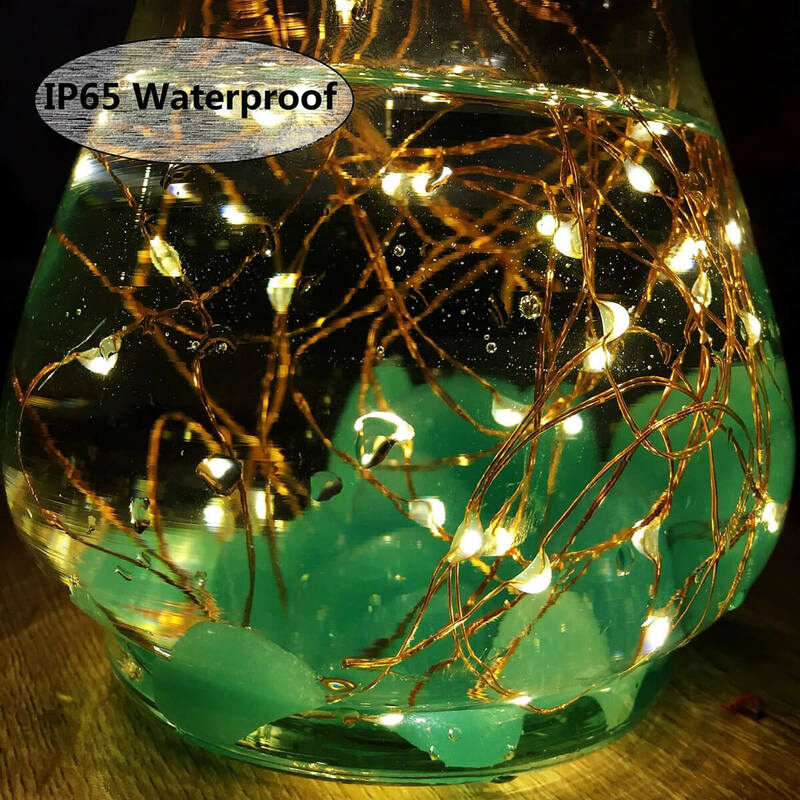 String lights – also known as fairy lights – are an awesome addition to a patio space. With thirty-three feet of lights, this option gives you the freedom and flexibility to place your lights up wherever you choose. The best part, of course, is that they are solar powered, which means no pesky extension cords tripping you up. 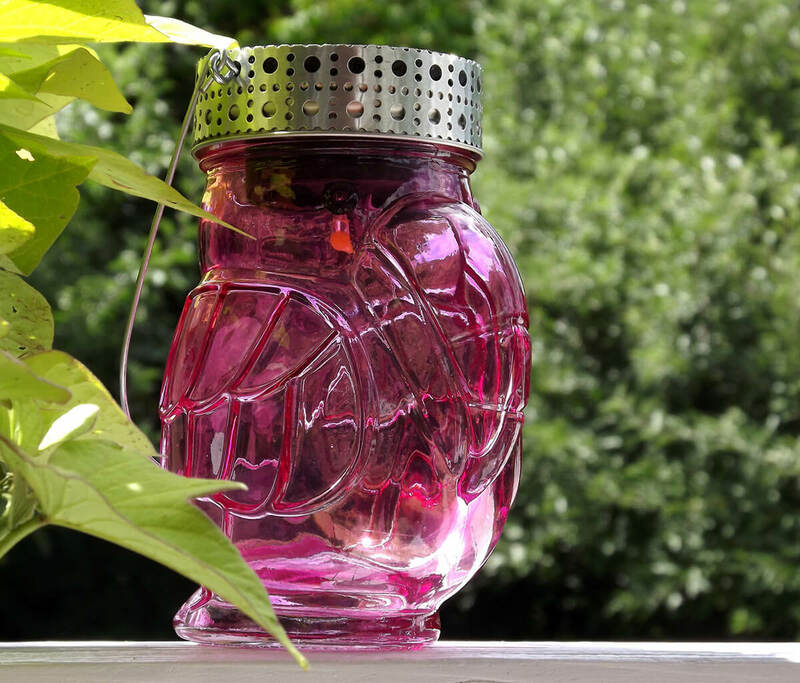 Coming in a set of three, these pink cut glass lanterns are a sweet addition to your outdoor space. They are hand crafted and have a mix-and-match, shabby chic vibe. 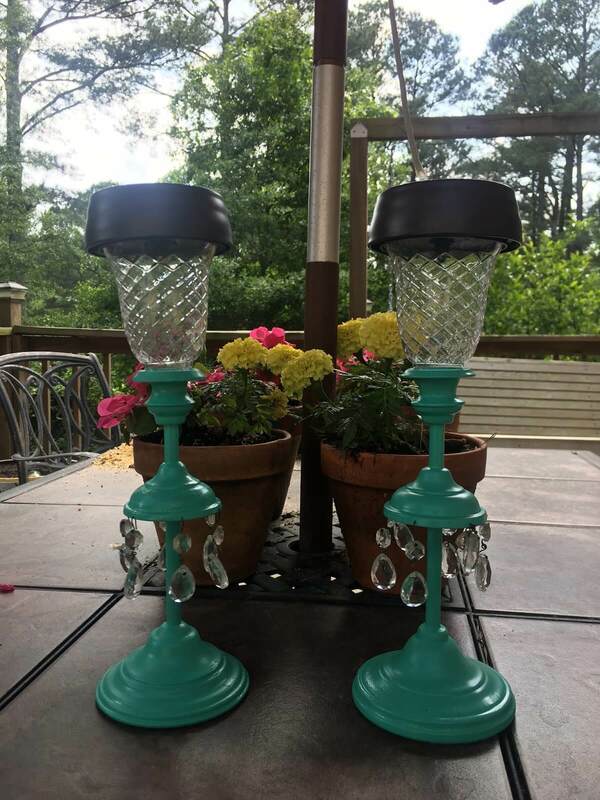 Made from hand painted glass and hammered steel they are treated for all sorts of weather and won’t lose their pretty paint. 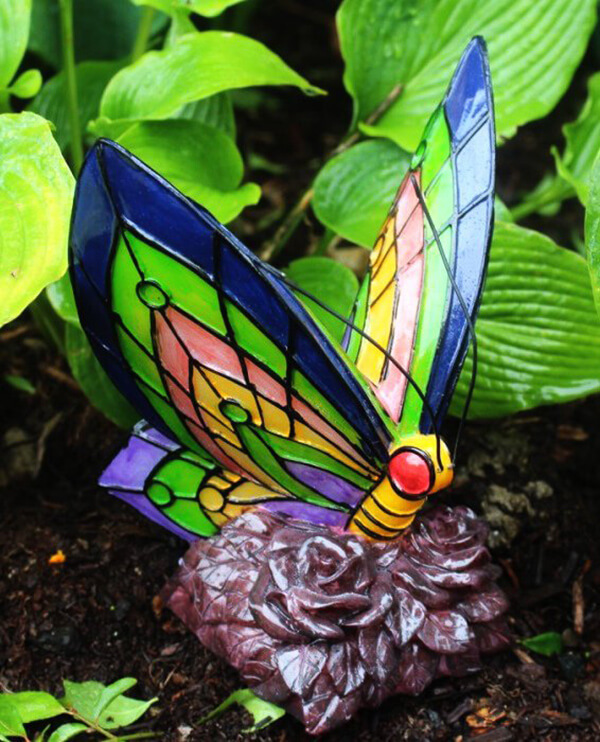 This super-bright multi-colored butterfly light is so lovely, you would hardly guess it served a purpose beyond décor. It is great for a garden or patio that you want to brighten up with both color and light. Although totally solar powered, this butterfly can also run on battery for those cloudy days. 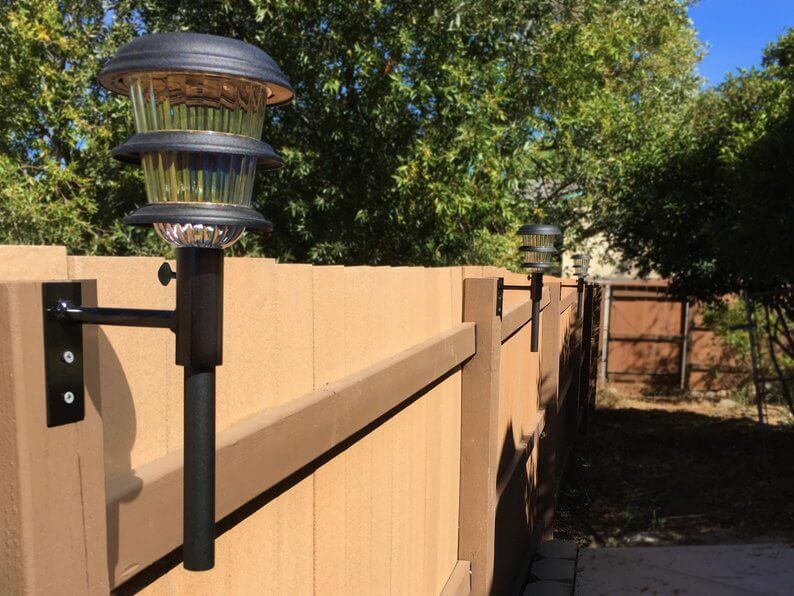 If you are searching for a way to keep your solar lights high and visible, these fence mounts are the perfect answer. Since they come in a pack of three, you can place them together or spread them out to light up the whole yard. Or, if you purchase multiple three-packs, you can arrange clusters throughout the yard. Hand-stenciled and painted, this sweet little lantern is 100% cuteness for half the price, offering a delicate fairy during the daytime and twinkling solar lights in the evening. Hang this in a tree for a fun garden surprise. With floral etchings, this piece is made for the outdoors and won’t fade away over time. Making it look as if you captured some adorable light-up critters, this frosted lantern is a great centerpiece for any outdoor space. 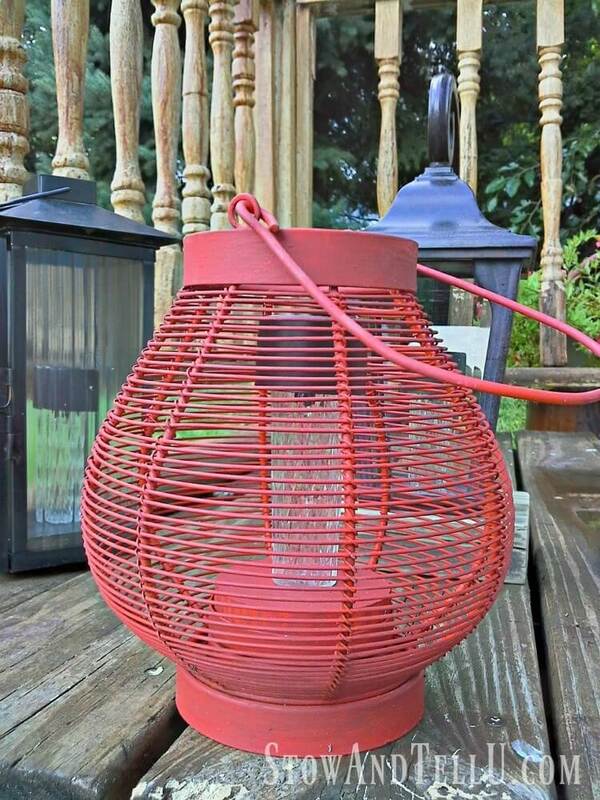 Because it has both a handle and a flat bottom, you can either hang this lantern or set it on a table. If you’d like to add more light, consider purchasing multiple pieces for a cohesive look. With netting and coarse ropes, these three logs look like they just washed up on shore. Fairly small in size at just two feet in length, including the light, one or two of these items can be placed anywhere for an added beachy look. Made to order, no two are exactly alike. Taking something like hammered iron pipes and creating something delicate from them can be a challenge. This chandelier does it just right. With a great balance between pretty crystals and hard iron, this fixture is a unique solar light source to display in your outdoor living space and will be a complement to any modern aesthetic. Whether you boast a mid-century modern look or simply enjoy the playfulness of a tropical bird, these solar-powered toucan jars are fun, plain and simple. They are available in two colors, so you can go big and have a whole flock of these pretty birds to provide easy, sustainable light for all your summer outdoor gatherings. 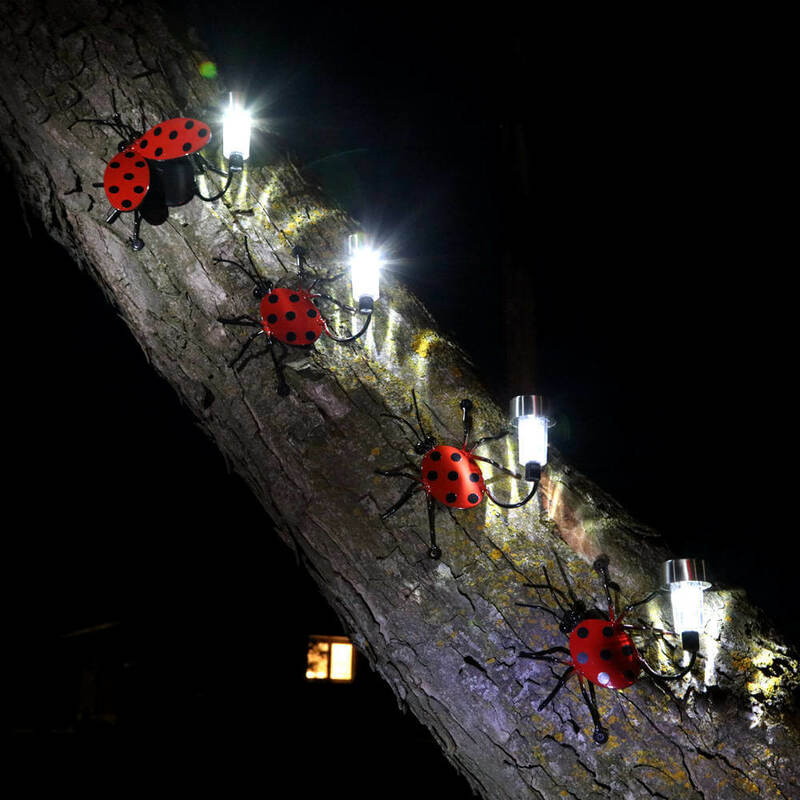 Each of these adorable little creatures attaches individually to posts or trees to create a playful family of ladybugs. A set comes with four bugs that can be placed however you choose all over your yard. Consider getting more to light up your whole backyard. Crafted with care, these bugs will last a long time and can weather the elements.